Kelly's Korner: Happy Fall, Y'all! Today in church - our choir and youth choir sang "The Revelation Song". I love this song and I thought this was the best our choir has ever done! Two teenage girls sang the verses and they are so talented - as I worshipped - I prayed that Harper would have a heart like Jesus one day like some of our youth do. I pray every night that He guides her steps and makes her a woman after His own heart and that He gives me and Scott the wisdom to guide her. I have a busy week. For some reason I always thought when I became a SAHM that I would be bored or not have a lot to do but my days are full! I have something EVERY day this week and I have two projects to tackle during every nap and after Harper's bedtime: Weeding our flower beds and getting them in shape before fall/winter and cleaning out my closet and getting it ready for fall/winter. I also need to try to go through Harper's closet and figure out what she has grown out of and what she is ready to fit into. I love fall/winter clothes. I LOVE boots and I love layering. I'm a little worried because last year I was pregnant and who knows if I can fit into my old normal clothes. I can NOT continue to wear maternity jeans so I either need to lose weight or get new jeans. I also am into cardigans this year and I'd really like to get some cowboy boots to wear with dresses! I have been shopping on ebay for a cheap pair! Another problem I have is my old "normal" fall/winter wardrobe was a "career" wardrobe so I don't have a lot of casual clothes that I can wear at home. It's not practical to sit around in high heeled boots so I'm trying to adjust. Also - I REALLY want to wear a scarf like all the cool people but I just look like a DORK! I can't make it work for me. Sadness. So I'll be doing quick updates every day but I'm going to try to stay away from the computer as much as possible so I can accomplish as much as I can! And don't get me started on the other things Fall brings (besides football) - FALL TV! My DVR is about to blow up and I can't ever find time to watch shows. What is your favorite FALL TV show or what is your favorite fall clothing item? Wow I am the first to comment!! I am so excited about the fall too!! I love getting to wear scarfs and my favorite Fall TV show right now would have to be The Biggest Loser! I love FALL! I have also been looking for a good pair of boots- I really like the pair you posted, I might have to check out Ebay's stash! I dont have a favorite fall show, there are wayy to many! A couple favorites would have to be biggest loser, Greys, The office, okay ill stop! Harper is so adorable I cant stand it!! Have you heard the Phillips, Craig and Dean version of "The Revelation Song"?? Loooove it!! My favorite fall shows are Ugly Betty and Desperate Housewives...they are both just so funny and crazy. My fave winter shows are "24" and "Lost"..cannot wait for those two, both are so suspenseful, love that!! Thanks for making my night with a post! My favorite tv show is the biggest loser..
As I pack up to take my son to Arkansas Children's Hospital in Little Rock tomorrow for his next round of chemo for treatment for Leukemia, I am praising and thanking God for His grace, His Love, and His Mercy, faithfulness...all that He is! My son and I love this song and I hadn't heard this version and it just gives me goose bumps. Thank you so much for sharing. I can't imagine how wonderful to praise in Church, with the Choir and God's people this must have been for you this morning. We love your family via blog land! 1. Love that song!! I'm also totally loving "Words I Would Say" by the Sidewalk Prophets...A-M-A-Z-I-N-G!! 2. Those boots are super cute and I just want you to know that you'd look absolutely adorable, no matter what you'd wear! 3. Of course you can pull off the scarf look, Kel!!! Are you kidding?! :) You'd look darling wearing one...have you really tried? Maybe you should have Melissa come over and see what she thinks...or Laurie!!!! I guarantee you could "DO" that look! I'm sure you look much better in cardigans than the model in your picture. She is scary skinny! I absolutely love that song! It is by far one of my faves and truly annointed!! Good luck on your to do list this week...mine is ever growing, but right now I'm living in denial...lol! My favorite thing about Fall...the leaves changing...gorgeous! I'm ready for the new season of Army wives...although the worst part of Fall is my husband will be deploying to Afghanistan and I'll be living the real version of Army Wives...sadness. Favorite Fall TV show: Lie To Me!! It is soooo good! It starts tomorrow (Monday) night on FOX and I can't wait! Favorite Fall Clothing: Juicy Couture Pants! They are so practical for us SAHMs. I bought mine on ebay for $30! I try to never pay full price, especially on $120 pants!!!! How about posting a picture of her without even mentioning her....we know WHO she is!! A day without Harper is a day without sunshine.......har!! My favorite Fall show is coming on tonight, Brothers and Sisters! Also, my favorite fall clothing are my Old Navy velour hoodies and pants sets. I'm sure some people think they are out of style but I'll continue to wear them and buy some new colors :) Also, Old Navy has some cute sweaters and cardigans on sale right now. Perfect for laying and wearing a cute scarf. You can pull of a scarf. I love them on everyone! I check out your blog everyday. I am a new Christian and I love reading your blog. You are such an inspiration. And, I learned so much. I have 2 little girls and because of your post today about your prayers for Harper, I have some new things to pray for my girls tonight. Thank you from the bottom of my heart. Ugggh- I can't pull off a scarf either - if you conquer it this fall let me know! I'm on a cowboy boot search too- and hey- when you start buying all your cute dresses- will you post where you got them from? I depend on you and Big Mama as my personal shoppers/stylists! Revelation Song is amazing. I want cowboy boots too. :-) You might try Sheplers.com - it's a local western store where I live. Cardigans are awesome and ANYONE can pull off a scarf, I'm sure you look great wearing one! okay, so i have never commented before, but i HAD to when i saw this post. my aunt wrote the Revalation Song!! always so surprised when I hear people talking about it or on the radio...just makes me smileto see the way that this song has traveled!! her daughter (my cousin!) just released her CD called "Happy In a Melancholy Way" by Emily Riddle. you'll love it!! its a fresh sound!!! blessing to you and your cute family! oh and p.s. you can find emily riddle on iTunes! I love that you love j.crew so much!!! I do too and just had almost the exact same conversation with myself about fall clothes being career clothes and needing SAHM clothes that are stylish but practical! These are the conclusions I have come to: Cardigans are super easy to complete a casual outfit and if you wear a skinny belt around your waist then you can be super stylish. Wear with jeans and you are practical and cute! Also, I have found that button down shirts are great for nursing, look like you put something together in your outfit, and go with just about anything. The thing I miss most about my work wardrobe are the high heels, oh how I love those fun shoes. I am trying to get on the flat wagon and there are some cute ones out there but I do love me a good pair of high heels! I love fall too, especially the clothes!! My favorite fall TV show would probably be Desperate Housewives or Biggest Loser! I haven't watched an entire season of Biggest Loser before, but I think it is so good...and motivating! My favorite fall clothing item would probably be sweaters and/or scarves! I love fall TV! The Office, Greys, Biggest Loser! The list goes on and on. My DVR was empty all summer and is now full! I have lots of favorite fall tv shows including Greys, Ugly Betty and many more. Thank goodness for DVR! I also love the fall and just found some great comfortable sweaters at Gap that you can dress up or dress down! Check out my blog to see them!! And biggest loser is my FAVORITE! You're a great mom! Keep it up! The best pair of boots I ever bought were Frye Harness boots in oiled brown. I got mine 5 years ago before they were everywhere. I love them and wear them all winter. I got them on ebay too! The Loft has some great fall clothes right now, especially cardigans, sweaters and jackets. They also have some great basic sweaters at Target and Old Navy right now. Try an outlet for jeans...I got one of the best pairs EVER at a Banana Republic outlet for $20. Last year was a post-baby fall for me so I remember your pain. Good luck! And I know you can totally rock a scarf! Girl, I absolutely LOVE the Fall TV lineup!!! My favorites are many: Army Wives, One Tree Hill, Dancing with the Stars, Biggest Loser, and Grey's Anatomy are my all time favorites! I love love love cardigans!!! I also plan on purchasing me some cowboy boots!! I am looking forward so Desperate Housewives!!! My DVR is starting to blow up too!!! All these great fall shows are starting!!! Hope you have a fabulous week!!! Living in California I do not get to enjoy Fall like many others. I thin Summer is my favorite season because I love sandals of all sorts. I love Fall too! Right now my new favorite TV show is Community with Chevy Chase and Joel McHale. It's only 30 minutes, but it's light-hearted, witty, and funny! I think it's just a nice escape. Favorite fall fashion? I am loving cardigans right now too. And since I'm in Georgia, I've missed my super dark blue jeans allllll summer! I will be so happy when it is cool enough to start wearing them again! AMAZING RACE is my favorite fall tv show !! Can't believe I'm the internet reading blogs as the show is still on !!! LOL. I love love love the Revelation Song! It just moves me every time. I don't have a favorite fall clothing item, except for maybe my denim blazer, but I just look forward to NBC on Thursday nights all summer! I am a huge Office fan. I love fall tv! My favorites are CSI Miami, The Mentalist and I found a new one this year that is really good called Mercy. I had to find something to replace ER!!! My favorite fall clothing item is my cowboy boots and my uggs. I love boots!!! Hope you have a great week!! I found a great pair of cowboy boots a few years ago at Dillards.. and they were really cheap, like under $30. I am so excited for my fall wardrobe as well, I have been pregnant for the last 2 fall/winter seasons and I am so excited to get out of elastic waist pants! I am enjoying the new Dancing With the Stars and the Office! There are things to talk about besides your baby? I'm just kidding (kind of), but seriously I think I've forgotten how to have any other kind of conversation! And I do walk around the house in high heeled boots. I have my old career wardrobe, too, and I haven't transitioned at all! I don't have a favorite fall TV show since I don't watch TV, but my favorite fall clothing item is a wonderful turtleneck sweater that I have had for years. It is definitely a good piece! My DVR is also about to blow up, because like you I can't find the time to watch anything! I would have to say my favorite fall shows are Desperate Housewives and Brothers and Sisters. I hope. We'll see what the season brings! Must admit that my two faves are Biggest Loser and Grey's! Hope you have a great week! So sad to hear I missed a great worship today. We were with the 2 yr olds today! I LOVE our choir because they bless me so! LOL...your mom's comment cracked me up (as I am a grandmother who also gets her grand-daughter fixes from my daughter's blog, I can relate!) I love cowboy boots...I have three pair and would wear them everyday! Have a great week Kelly!! fall is definitely the best. (besides christmas!!) i love long sweaters. they are just so flattering. i also love a good pair of flat ballet slipper type shoes. they are just too comfy. i'm a new mom too, to an 11 month little boy & i'm 5 months pregnant with a little girl. so i don't think i can run around in heels either!! i also LOVE to have a bunch of fall scented candles around my house. it just makes home so much cozier! my fave fall tv show is House. the hubby & i look forward to it every monday night. there are a lot of new shows on tv this fall, so we love to snuggle on the couch, after we put Jack to bed, & watch some tv before bed. but of course, we watch tons of football around our house. every weekend, we're watching the VOLS ( yay for the SEC!!) and the Colts. we love peyton manning! have a happy fall! you've inspired me to do some fall clothes shopping!!! We sang the revelation song today too! GLEE is my favorite new show of the season. It is hilarious! Love your blog! Sorry you guys didn't beat Bama. I'm an Auburn fan and grad and can't stand Bama! Love all the other SEC teams tho! Oh my gosh, I don't even know if I have just one favorite fall TV show. Ha! There are so many...The Amazing Race, Dancing with the Stars, Survivor, Gossip Girl, Ugly Betty, and so on and on and on. :) As for fall clothing, I always look forward to wearing sweaters. But there is something comfy about coming home and putting on pajamas early (yes, I really said that) or even just sweatpants and a sweatshirt. I LOVE Lie to me! Such a great show. Staying at home does certainly call for a whole new wardrobe! I can't wait to see what you get- your clothes are SO cute. When I was shopping this weekend I kept saying to my sister "wouldn't Kelly be SO cute in this outfit!" My thoughts and your thoughts were alike tonight. I had to make sure my DVR was set for DEsperate Housewives, then I remembered that I have never watched the last two episodes last season. I thought I would have watched Grey's Anatomy by now from Thursday and have not. Oh my there are a million others too I am so far behind on. I am wondering exactly when it will tell me it is at the limit. Hopefully after I have taken some time to catch up on a few. I was thinking about how my DVR is going to be going crazy each week tonight as well. Desperate Housewives, Brothers & Sisters, Gossip Girl (ok, pathetic), and top chef. My favorite fall item: J Crew's Chimera Blazer. I received it as a birthday gift! Favorite Fall shows (this year) include Survivor, Amazing Race, The Good Wife (new show this season)and Top Chef! I can't believe I missed the music at church this morning. Boo! I've been waiting for the choir to do this song since this summer. It's such a good one, I love it. Have a fun week. My husband was a student at Christ For the Nations when Kari Jobe and their worship team first recorded Revelation Song! We have loved it for years. In our home, The Office is always the favorite TV show. It's the only one we really try not to miss. I love it when the weather finally gets cool enough here to wear sweaters. I will be doing a lot of borrowing this season, since staying at home means only truly needed clothing items will be purchased! as far as fall clothing goes...i have to err on the practical side instead of being fashion forward (what a shame!) and say my brown danskos. they are just too comfy! I love fall! I have several pair of shoes that I wear during the fall and am thrilled to wear them again! My favorite fall show is Grey's Anatomy. I'm SO with you on the scarf thing. I'm dying to try wearing one, but how? With what? My favorite things to wear in the fall is my ugg boots and hoodies. So comfy and cozy. Hope you get your projects tackled this week..then you can just come on over to my house and tackle mine... *wink* Have a great week! Fall is my favorite too!! I love wearing warm clothes and all the layering. This winter I'm pregnant, so it will be very interesting as far as my wardrobe! One thing I CAN do well is eat...bring on that pumpkin pie! Yes, fall is in the air here in Michigan. It is supposed to be only 55 degrees here tomorrow. I must admit though I'm not ready for fall or winter this year. However, I do have a new favorite fall outfit. Yoga pants and a super cute sweatshirt I got from Ambercrombie a few weeks ago.It is an off the shoulder slouchy type of sweat shirt and I can't wait to wear it with youga pants or jeans. Oh and I also can't wait to wear a brand new pair of jeans and a pair of adorable boots that I got. I agree with the scarf thing. I tried in a really cute ruffle shirt the other day with a scarf attatched to it, and it looked like somebody cut off my neck...so not a good look for me. As far as fall tv, yeah my DVR is going to explode too. I LOVE Dancing with the Stars, Brothers and Sisters and Desperate Houswives. However, there are lots more good shows this year that I'm going to try out as well and see how I like them. Have a great day tomorrow and I hope you get all your projects done. Ha, I just got all my Fall clothes out, washed them, and put them in the closet! I love cardigans from Jcrew, and they actually have some on sale right now. My fav fall TV show is definitely The Office, but my close 2nd would be Project Runway! Have you seen it? Something tells me you'd like it! ;) Hope you & little H have a great week! My favorite song of all time. No matter where I hear it, I have to stop and lift my hands. Makes me long to sing at the throne. I am BIG into cardigans right now! I have several new ones and I want more!!!! :o) I am loving the boots! It sounds like you'll have fun shopping for some new clothes! I just found an awesome pair of jeans on sale at Express this weekend - not the supper trendy (at least lets hope it's a trend) skinny jeans but normal waist, boot cut, dark jeans (slimming). So if you're looking for a good pair this fall check 'em out. As far as the TV line up goes I'm all So You Think You Can Dance - because I can't and love watching people that are so good. Glad you had a great Sunday! Love The Revelation Song and Kari Jobe too! I have her CD and listen to it all the time. So many of the songs she sings just touch my heart and I can feel the Lord's presence so strong! P.S. Hope you get lots done this week! I know what you mean about the scarves! It looks like an easy look, but it's not! You would NEVER look like a dork....so bring on the scarves!! Have a great week, Kelly! Ann Taylor Loft and Old Navy have some really good options for layering and espeically cardigans! I got my cowboy boots at TJ Maxx. I lucked up! I have also found several fall/winter items at TJ Maxx. You can pull a scarf off I promise! Wal-Mart has really cute scarves for $5 and $7! I have bought several and look to see if they have gotten new ones almost every time I go! My DVR is full too with episodes of Glee, Grey's, Army Wives and Drop Dead Diva! I LOVE this song! And I love Kari's version...she is a worship pastor at our church. You have to come visit Gateway if you ever come to Dallas! (well, N. of Dallas anyways) Love the boots! Our song leader sang "Revelation Song" during The Lord's Supper a few Sundays ago, and there wasn't a dry eye in the sanctuary! SAHMs stay extremely busy! I wish everyone could understand this!!! P.S. I'm a sucker for Desperate Housewives and House! Forget the light bulb, automobile, and Post-It Note. The DVR is the greatest invention of all time. Long live The Office and So You Think You Can Dance!! I love me some boots too! So ready to break mine out! I am looking forward to all the fall clothes - but I know what you mean about wondering if things will fit from the year before! I just wish I had having a baby as my excuse for that! ha ha! But I think still kind of being a newly wed is my excuse! ha ha! I am excited about fall, too. It's been a long, hot, humid & DRY summer here in beautiful NC. I'd like to rearrange my wardrobe for fall, I wear the same old drabby things the past couple years. I need a change-up, too. I really like HBO/Showtime shows. But I do watch Survivor, Medium/Ghost Whisperer, & Dexter on Showtime. Fall is my favorite time of year!!! I really need to do some shopping to update my closet!! I just love fall. Stay at home moms do work very hard for their families as I have been one for the last 10 years and also work my candles home business when I can and want to. I never miss anything with my children. Football is huge in our family as well as I have one in High School and one in Middle School. My evenings are very busy getting them both back and forth but before you know it the season will be over. I will miss sitting on the field watching them have fun. Your too cute! I love cowboy boots! I love fall too! My fav fall shows are Biggest Loser, Dancing with the Stars, and Greys.... Love them.... Hope ya have a great week! Fall is my absolute favorite time of year. I love jeans and sweaters. I've been wanting some boots for a few years now - maybe this will be the year I actually get them. I have an almost 5 month old so I totally get the concern of fitting into your normal clothes. My favorite fall tv show is House. That's the one show I always keep up with on my dvr. I try to catch Dancing with the Stars every so often and watch pretty much every cooking show on every channel there is! There are some tutorials on-line about how to wear scarves! Check them out. I think you would look great in anything. The Office + sweaters = Happy Fall! Hi...the only shows I watch on network TV (i.e., starts in the fall) are Extreme Makeover Home Edition (on ABC) and Numbers (on CBS)...the rest of "my" shows are on TLC and they seem to start "seasons" all throughout the year...but the best thing about Fall is football!!! I am a big college FB fan, and I will even watch pro FB to learn more about the game...I love to do it while I cross-stitch, and I am working on a birth record for my dear friend's baby-girl-to-be-named-later (they have 75 'no' names and all their 'yes' names are in the top 10 and they don't want that for their daughter!) Harper is precious in her Hog gear...we are Ohio State fans...my Dad taught there for 35 years, my brother graduated from med school there, my sister-n-law got her PhD there and all her family went there...so GO BUCKS!!! :) Thanks for your blog--you are a blessing! The Mentalist is my favorite! I know what you mean about wearing something that looks cool on others. I can never pull of the pretty scarves that people wear in their hair! H-E-L-P!!! So, I got the red ruffle dress from Francesca's that you have (except mine is a fallish red, not red, red). I am speaking at a retreat this weekend and am planning on wearing it one day IF I can find the right shoes. I know you don't have Fashion Friday or anything, but please ... what shoes are you wearing? I feel like it's too summery looking to wear it with most of the stuff I have. Boot idea is great but I'm not sure I'm cool enough to pull that off. Especially in front of a crowd! So please, if you hear me ... tell me what type of shoes to wear. And I LOVE the boots on your site...wondering where they are from too. Can I just say how REFRESHING it is to hear the Kari Jobe version of this song again? I like PCD and all but...WAY overplayed. This is a breath of fresh air! Love her and this version the best!!! My fave fall TV shows are Dancing with the Stars and The Office. I am also liking Jay Leno in prime time. Of course, the weekend is filled with college and pro football. As for fall fashion, I love tops with 3/4 length sleeves. Also, I love sweaters because it means no jacket. There are only so many things (diaper bag, 2 boys, their coats, etc.) that I can carry. I can't wait for some cooler weather down here in Florida! I love EVERY single one of Kari Jobe's songs. Incredible words! By the way, I really think you could pull off a scarf! They are such a fun accessory! My favorite thing to wear in the fall is sweaters. I can't wait to start pulling mine out. I am going to try one night this week to catch up on it online. Ok, let me start by saying Harper was a game day doll on Saturday! I'm sorry your beloved hogs lost again, but I am praying they go down next week against my Aggies. :) We've had some pretty brutal seasons so we need the wins big time. ha! As for Fall....LOVE it. Football, cooler weather, being outside...it's the best. For TV I am a huge Biggest Loser fan. I get so caught up in their lives and truly feel joy for them when they change their lives thorugh weight loss. I need to do some of that myself! 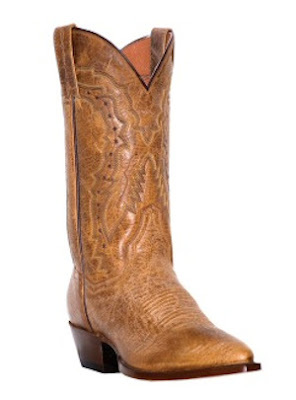 And finally, the boots...I have a pair of Lucchese boots in the Maddog style and they are so comfy and they look great! Happy shopping! Scarves are so easy try to pick one up at Old Navy, Wal-mart or Target for cheap. Also my favorite show is CSI, The biggest Loser, and Extreme Home Makeover Home Edition. I also Love FRINGE, I think when I was a little girl my dad turned me into a science freak! HA! Hope you have a great week! Love the outfit you posted. I would say a couple pair of jeans/with fitted t shirts and sweaters something you could combine with your work fall clothes if needed would be best but can't wait to hear about what you figure out! i dont know if i have ever posted a comment on your blog before! my name is jenn and i am also a sahm! as far as scarves go, i love those also but i always feel a little silly wearing them because im not sure quite how to tie them! do i just let them hang or how do they get those super cool knots going!? either way there is much fall excitement here as well! Maybe I am the only one who is not excited about the cool-weather clothes fall requires! I personally don't like layers - I feel like they add too much bulk! And fall/winter clothes and shoes are so much more expensive! (ex: I can get a cute tank top, shorts, and flip flops for a tenth of the price I'd pay for a sweater, jeans, and boots). Oh well, enough whining! At least us stay-at-home moms don't have to worry too much about clothes! We can get away with a lot less outfits in our wardrobe than a working mom! I love fall too! My favorite thing about Fall is the leaves changing colors!! Where I live the leaves don't change color so it bums me out. But where my family lives they do and Im going there this weekend!! So I am super excited!! My new home next year the leaves change colors so I can't wait!! And I also love wearing ballet flats..I recently got into them this past fall and I must have like 10 pairs now! Oh and I love fall color clothes! I got the cutest orange henley last fall and I can't wait to wear it again soon!! I would highly recomend taking all of your old work clothes to a local consignment shop! I have made tons of money to go out and buy new clothes off my old stuff! Yes, fall T.v. is blowing up everyones dvrs! My favorite shows this fall are probably similar to lots of you....Grey's, Bones, SYTYCD, and I am starting to really like Glee! I really love Fall! I like watching Greys Anatomy, Brothers and Sisters, Private Practice....oh there are more, but I dont want to take up all your space. I do like Desperate Housewives too! Harper looked so cute in your Roll Tide post. I love her little outfit! Fall makes my heart happy! I love it! My favorite fall thing is boots, then sweaters! That's one of my favorites songs. Wonderful worship song. haha i had to laugh about my DVR. i absolutely love grey's. i dvr it b/c my husband does not care for tv. about the only thing we're watching together these days is football (no problem for me i could watch it 24/7) or fox news. we have discovered jay leno which is nice to be able to see while we're still conscious ha! i am also a big fan of dancing w/the starts. i'm looking forward to checking out trauma. and i'm looking forward to parenthood which comes out mid-season. i'll miss maura tierney who dropped out of the show b/c of breast cancer. Go for the scarf look, I thought I would look like a dork too if I tried this look, but I actually find that I look a little more sophisticated. It kind of makes a tshirt and jeans look a little more pulled together, one of my fave new looks. The boots you posted look just like the boots I bought for this fall. They are Dan Post and SUPER comfy!!! LOVE EM!! They weren't my first choice, but when I tried on "my first pick" I chose these for the comfort. What a GREAT song to start the week off with. LOVE IT!!! Good luck with your shopping, etc. I totally LOL'ed when you said it wasn't practical to sit around in high-heeled boots. So funny! I also love fall clothing. Warm and cozy. It is amazing how full our DVR gets come September :)! We have found ourselves even watching shows while we get ready in the morning...LOL! I totally know what you mean about the scarf. I just can't pull it off. What a beautiful, inspiring song! I loved it and thank you for putting it up here today! Kelly~I just wanted to say that I love your blog, your faith in the Lord inspires me to be a better person and focus more on my walk with him~that is truly a gift to inspire others and I hope I am doing the same for the people around me. This fall I am loving~boots, scarves, animal print, plums/grays, and skinny jeans w/ a sweater/cardigan and boots-I need to find a great pair of boots too! I also couldn't agree more about fall TV in football season~we are Iowa Hawkeyes and they might just have had the best game ever on Sat w/ their win over Penn State!! We have season tickets~but now that I work evenings as a nurse I have had to miss most of the games...so sad! That's the real world I guess! I LOVE my cowboy boots! I bought them on eBay about 4 years ago! I got a great deal on them and I wear them with skirts, dresses, and jeans ALL throughout fall and winter! I'm not a big TV watcher, but I love the show "Big Bang Theory". The name can be a little off-putting, but it's just a show about 4 nerdy guys who do nerdy stuff and oogle over the blonde next door. It is really hilarious! I love,love,love Fall too! The air is so crisp and NH is breathtaking this time of the year. I am an UGG girl with my jeans and long cardigan sweaters. I think that was my almost everyday outfit, when I left the house of course. I need to shop for a few new sweaters though. Last years are not looking so hot. Yeah for season Premiere's. I am a Grey's Anatomy, Desperate Housewives, The Office, and Survivor fan. There are a few new ones I watched last week to see what they were all about, like Cougartown and the Good Wife. Thank goodness for DVR. I never get to watch them when they are actually on. What did I do before.? I am sooooo with you on the scarf thing! Besides living in Texas where scarfs are kind of silly, I just look like I am trying way too hard when I wear them. Major Bummer. It finally feels like fall here...sort of. I'm in CA and it's been over 100 degrees all weekend. Today, it's only going to be 91. lol. But there's a little breeze, and the leaves are turning colors. I can't wait for rain! Just stumbled on this blog and LOVE all the comments! My favorite things to watch on TV this fall are: The Amazing Race and Colts football! I LOVE the Revelation Song...it's my favorite right now. I listen to it on the days when I go to work...such a great start to the day! I like P, C, and D's version, but Kari Jobe's is much more powerful! Anyway...sorry to ramble! My favorite Fall show is Medium, Law and Order SVU, and Desperate Housewives (my guilty pleasure!). My favorite Fall clothing is cute Fall dresses with boots. :) I also love jeans and a long sleeve cozy t-shirt. I love fall for football, pumpkins and cooler weather. My favorite fall show is Grey's and Private Practice. What happiness these shows bring me (my quite time after girls go to bed). As for clothing I love solid color long sleeve t-shirts. I'm a teacher so these are great for work and weekend. I dress them up with some cute pants, jewlery and shoes during the week but then they are great for just casual around the house on the weekends. Thank you for posting that video. I think that must be one of my all time favorite songs. I'm sitting here feeding my son oatmeal and apple sauce while I eat my oatmeal and drink coffee. The sun is rising and it is BEAUTIFUL outside. The song totally fits this moment! God's creation is amazing! P.S You aren't the only one with an 8 month old who wants to get up at 5:30am. We've been up since about that time today. I love the show Bones. I'm such a fan of crime shows. Also - I have a couple pairs of cowboy boots and I found one pair at RackRoom shoes. They have lasted 5 years and I've even had them re-soled. Love your blog....I don't even remember who told me about it. We are currently watching Biggest Loser, Hells Kitchen, Dancing with the Stars and The Office. I love fall!!! Absolutley LOVE the boots!!! Favorite fall show? The Office--funny, funny!! And, of course, anything on Food Network :). I am also excited about fall. And, I really hate to say this, but I feel much better knowing that I'm not the only one who hasn't moved out of her maternity jeans yet. DD is almost 6 months. I am going to have to bite the bullet and buy some new jeans--maternity is too big and pre-maternity is still too small. My suggestion for a casual and totally meaningful look is a T from Wild Olive Tees. Beautifully designed, great fit, look great layer with long sleeve shirt under them or wait or their new long sleeve shirts coming soon. I prefer the fitted T...great with jeans for a comfy feel yet a look that is more put together than a boxy T-shirt. A woman in my MOPS group started this biz with two other women. Awesome woman of faith and talented in design. Some of their proceeds go to charity. They are coming out with new designs soon...I'm working on losing my most recent baby weight and will be treating myself to a few new ones!! Check them out! www.wildolivetees.com if you hurry they have some discontinued T's on sale!! My fave thing for fall is boots with skirts! Short skirts and tights, long skirts. Good luck with the shopping.